Earlier this month we published a map of active Marcellus shale wellpads in Pennsylvania as observed on aerial survey imagery from 2005, 2008, 2010, and 2013 by our FrackFinder citizen scientists. Now we thought we’d take a closer look at one of those hotspots of drilling activity, specifically an area in Washington County, PA near Cross Creek County Park and the town of Hickory. For this visualization, we created a 3.4 acre buffer around each active wellpad, a number we derived from our related work mapping the footprint of wellpads in Eastern Ohio. We have not yet measured the cumulative footprint of drilling activity in Pennsylvania, so we used the median area for wellpads in Ohio’s Marcellus and Utica shale play. However, the impact of drilling is not just restricted to the gravel parking lot around a wellhead, it extends to service roads, pipelines, waste impoundments, gas separators, compressor stations, etc. So to visualize that impact, we have also included a snapshot of the aerial survey imagery for the same area from each of the respective years. These visuals are cumulative, meaning that not every wellpad was visibly active at the time of the aerial survey. However, given the predicted lifespan of shale wells we can expect that almost all of these sites could be expanded and re-fracked several times over the coming decades. If you want to take a closer look you can download high-resolution stills from our album over at Flickr or explore the interactive map of all observed, active wellpads in Pennsylvania. This kind of dense drilling activity in close proximity to homes and towns is cause for serious concern with recent findings by our partners at Johns Hopkins who found that “expectant mothers living in the most active area of fracking drilling and production activity were 40 percent more likely to give birth prematurely (before 37 weeks of gestation).” Our goal with these maps and mapping projects is that the resulting data will be used to better understand the public health and environmental impacts of resource extraction activities like fracking. Did you know there are 48,529 abandoned coal mines in the United States which are known to pose a threat to the public and/or the environment? This number comes from the most comprehensive federal database that we know of – the enhanced Abandoned Mine Lands Inventory System (eAMLIS) maintained by the Office of Surface Mining (OSM). Of the 48,529 abandoned mine sites shown on the map below, 36,191 are categorized “Priority 1″ or “Priority 2“, meaning they pose a “threat to health, safety and general welfare of people.” The remaining 12,408 mines are classified as “Priority 3“, that is, sites which pose a threat to the environment. However, because this map only includes mines that are truly abandoned AND which have been catalogued by the federal government, this map is probably not a complete inventory of the abandoned and inactive coal mines in the US. Click here or above to explore the interactive map. Back in August the Animas River in southwestern Colorado turned orange for miles after millions of gallons of mine waste erupted from an inactive gold mine. The dayglo color of the river, coupled with the fact that the spill was trigged by contractors from the Environmental Protection Agency (EPA) trying to fix the problem, captured national attention for weeks. In response to that spill we took it upon ourselves to map nearly 65,000 inactive metal mines using the most extensive federal database that we could find. The spill from the Gold King Mine was not the first of its kind, and it most likely will not be the last, but it revived discussion about the challenge and cost of reclaiming an estimated 500,000 abandoned and inactive mines (gold, coal, and otherwise) that litter the landscape. According to OSM definitions this database of problematic coal mines includes 1,167 “Dangerous Impoundments”, 1,298 sites with polluted groundwater (“Polluted Water: Agricultural & Industrial” and “Polluted Water: Human Consumption”), and 276 “Underground Mine Fires” like the one still burning beneath the ghost town of Centralia. But again, we have to add a caveat: just because a mine was classified abandoned does not mean that there hasn’t at least been some effort made at reclamation. “Abandoned” in this context means that the responsible party (the mining company) has reneged on their responsibility for reclamation, leaving the taxpayers (you and I) stuck with the bill to clean it up. Above: The Cheat River in Preston County, WV still has rocks stained orange by acid mine drainage from an abandoned mine which first blew out in 1994. 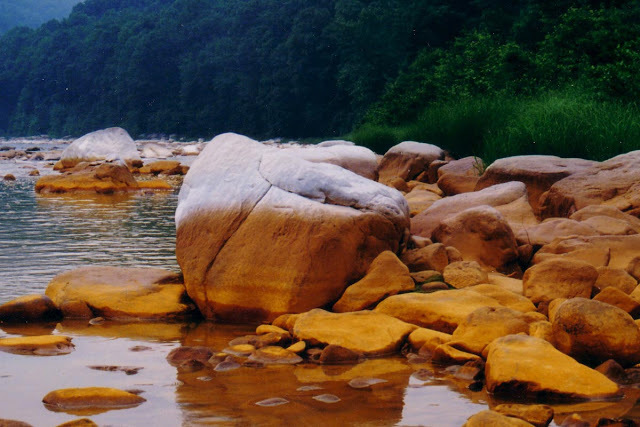 Read the history of that mine blowout and the efforts which have restored the Cheat River to a thriving, life-sustaining waterway. Image via Friends of the Cheat. This database primarily covers abandoned coal mines. While there are a few non-coal mines in the database, we did our best to exclude any non-coal mines based on the federal funding source assigned to their cleanup. With some guidance from a GIS specialist at OSM we believe this map provides a decent overview of the known high-priority abandoned coal mines, but please let us know if you discover any mistakes by commenting below. Much like our previous map of abandoned and inactive metal mines, this map is only part of the story. There are many flaws within the federal database, including contradictory descriptions of what the various fields mean. But while we know this doesn’t show every abandoned coal mine the country, and some sites may have been expertly reclaimed by state, federal, and non-profit initiatives, this map also underscores the alarming lack of reliable data about sites which could still cause disastrous releases of toxic wastes for decades to come. 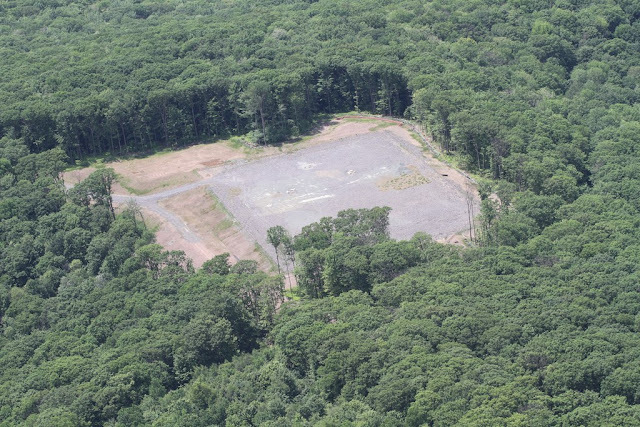 Citizen-scientist analysis of aerial survey imagery from 2013, validated by SkyTruth, found 1,615 new wellpads in Pennsylvania’s Marcellus Shale (and related Devonian shales). This latest result of our ongoing FrackFinder projects brings the total to 2,724 active industrial operations that we have identified spread across the fields and forests of Pennsylvania. These numbers are not to be confused with rig counts (which maxed out at 116 in 2011 and 2012) or the total number of shale wells drilled in William Penn’s woods (over 7,788). Because drilling rigs move around and operators often drill multiple wells from each wellpad, this count is a more accurate representation of the number of locations around the Commonwealth where land has been cleared, pipelines have been laid, impoundments have been built, water and chemicals have been trucked in, and equipment has been assembled to drill and frack one or more wells. Click here or the animation above to explore an interactive map of wellpads observed in 2005, 2008, 2010, and 2013. 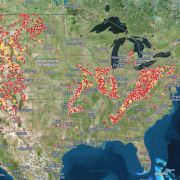 The animation shows all observed wellpads cumulatively, 2005 = Blue, 2008 = Yellow, 2010 = Orange, and 2013 = Red. By itself this data might not be much different than what you could generate from looking at permit data and when drilling began, but we have included this phase in all our FrackFinder projects so that we can be sure we are looking at all the right places. Sometimes permit data is backlogged and a dataset you download today may not reflect everything that is happening in the real world. Additionally, having several years of crowdsourced image analysis data will enable us to do some nice comparisons to see how accurate state data are, as well as check the accuracy of our citizen scientists. To provide some context for all those points on the map, check out these aerial photos from our parters at the Downstream Project. Wellpads are typically 3-5 acre gravel parking lots surrounded by roads, impoundments, pipelines, and other related infrastructure. In high-density drilling areas, or areas with a lot of steep terrain, these sites can occupy 15-20 acres of interconnected industrial activity. Ultimately, we are doing these studies so that we can better understand the public and environmental health implications of living near these operations. Stay tuned for news about a new FrackFinder project coming up for a brand new state (Hint: It’s a very mountainous state and the only one in the Union with this cardinal direction of the compass in its name).